Fall is upon us and I’m delighted because it is my favorite time of year. It’s mainly because of the holidays, I’m not gonna lie. In my opinion the greatest ingredients are available for us to cook and bake with in the Autumn months including cinnamon, cranberries, and apples to name a few. That why the next installment in my mug cake series had to be Microwave Mug Pies!!! Yes, Pies made in the microwave. You don’t need to make a huge fuss, you only need a small amount of ingredients and you will be eating pies in no time! I wanted to show you my recipes for traditional American Holiday pies which are Pumpkin Pie, Pecan Pie and Apple Crisp. Now I know what you are thinking, how did she cook crust in the microwave? Does it have the same smooth texture as a baked pumpkin pie? Yes, they are bite for bite the same as a baked pie, the only difference is you get to enjoy them in less time and and there’s little washing up! It’s hard to argue with that. There is a feeling of comfort around this time of year, probably because of the crisp weather and shorter days. We spend a lot more time hibernating than the rest of the year which is fine by me. These pies are full of fall flavors which to me are rich, hearty and warming. Holiday baking is traditional for me being from Ireland. I baked with my mum last year and we made Apple Crumble (aka Crisp). I love those times, however when my sweet tooth takes over and I want Apple Crisp NOW, well that’s the beauty of these Microwave Mug Pies. Every country has their own traditions around Halloween and Christmas, however I never celebrated a Thanksgiving until I moved to the U.S. in 2008. I love Thanksgiving because it’s like a warm up to Christmas. You get to have Turkey, stuffing, pies–the works all before Christmas day. Pumpkin pie was a first for me, and I’m not going to lie, it took some convincing to try it but once I did I knew why it was such a fan favorite for Thanksgiving. Pumpkin Pie has lovely warm flavors that all balance well together. It is smooth in texture and a lovely combination of sweet and creamy. And now it’s even easier to make. In a microwavable mug add in your crushed cookies to the bottom. Microwave roughly 1 1/2 -2 minutes, checking every 30 seconds. The top may look slightly damp but it will set as it cools. Cooking time is based on my 1200W microwave so your timing might vary. Carefully remove the mug from the microwave. Let it stand for a couple minutes to cool. Serve with whipped cream and Enjoy otherwise place in the fridge for up to 24 hours. *notes: make your own pumpkin pie spice or use cinnamon. An oldie, but a goodie. I love a good crisp because it transports me back to my childhood in Ireland. Put some vanilla ice cream on that bad boy and I’m in heaven!! In a small bowl stir in the oats, pecans, sugar, cinnamon, and the salt. Chop the apples small and toss them with the ½ tablespoon of flour, ½ tablespoon of the sugar, and ¼ teaspoon cinnamon. In a microwavable mug fill with the apple. You can fill up the mug because the apples cook down. Spoon the crisp mixture over the top. Microwave for 2- 2 ½ minutes. the apples should be bubbling and the whole thing will reduce in size. Cooking time is based on my 1200W microwave so your timing might vary. Carefully remove from the microwave and let stand until cool enough to eat. Be careful because it's going to be really hot at first! This pie is not for the faint hearted since it is rich and full of maple goodness. This pie, combined with toasted pecans and served with some cream or vanilla ice cream, and I am in HEAVEN! In a small bowl, whisk together the butter, brown sugar, maple syrup, vanilla and salt. Whisk in eggs. Pour in your pecan pie mix. Microwave roughly for 1- ½ minutes, checking every 30 seconds. The mix will thicken and appear jelly like, but it will set as it cools. Cooking time is based on my 1200W microwave so your timing might vary. *notes: Make the pecan pie mix 24 hours in advance. Once microwaved you can place in the fridge once cooled for up to 2 days. Cooking time will vary greatly depending on your microwave and the width and depth of the mug. 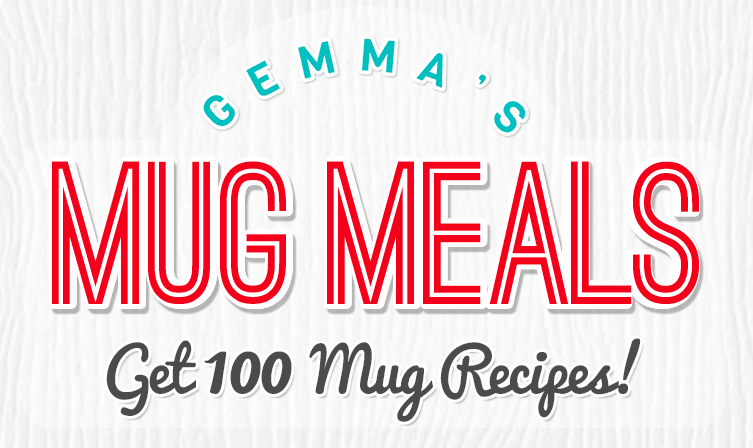 Get 100 Mug Meals on Gemma’s Mug Meals Collection Page. I love your recipes and your site! Thank you so much for this message, i am delighted to hear that! Tried the apple crumble pie and loved it.. I’ve a teenager who is always hungry..lol.. Gemmas mug meals are life savers for me..Be it late night ‘Im hungry’ snacks on school days or afternoon ‘Im bored’ snacks for school holidays, Gemma comes to the rescue.. You are a Superbaker (in addition to being a boldbaker)..:) Lots of love. you are a #bold baker! Can you make the pecan pie mug with more crushed crackers for those of us that like more crust ? Or would that cause the cooking time to change or need to use a bigger mug? This sounds delicious, looking forward to making it. Do we have to make the pecan pie filling 24 hours ahead of time? No you don’t have to, I was just saying you CAN if you want. But you don’t need too. Can I leave out the oats? Yes, but I think you will need a little more flour, perhaps another tablespoon of flour. I’m thinking of putting a whole shortbread cookie in the bottom of a mug for the pumpkin pie…what do you think? Rolled oats, where you can see the round shape, will work best. These can be the quick cook version, or the more traditional one, you can choose. Oats are generally regarded safe to be eaten as you buy them, they are already processed to a greater or lesser degree, hence their use in muesli. I was wondering if I can make the apple crumble a few hours beforehand (maybe 2-5 hours) and cook it later on? If so, what is the best method of storage during those hours? Apples tend to discolor, so are better cooked when they are peeld, before they get a chance to oxidize. Lemon juice stops this too. I love to meet you as well done day. I am making this one pecan & apple thus week. Just need buy cute mugs just cuz want them,but nit sure can find ones like yours shape,which know about,but not seen store. I don’t know where to find exact like yours single pieces not allot. I seen maybe tv or store when younger,but now not know where in Tampa. I good u make an appearance near WestShore Mall during daytime hours for I don’t drive & travel by city public transport bus. Preferably dart of Spring not to hot or daily rains or storms yet no cold in fall,winter & w longer. U could help me out to find out where can get exact shape of you mugs not the exact color or patterns,but I do like the light blue the pecan pie one & love clear shape 1 for the apple. I have plenty mugs collector of pretty,but not all microwaveable anyhow. I really must have shape ones of some of your mug recipes & with size too counts. I don’t have those attractive cooking in it serving at same time one. I can’t wait to make pizza & lasagna one go lunch ir dinner. Some substituting today or just wait til get the rest like pecans need for both apple & pecan. I also,want to make the ice cream & my own whipped cream,marshmallows,& marshmallow fluff,sour cream,etc just missing some ingredients. Maybe cam make cream for my chip. I will post pics when make each. I wish it was one mug dessert this evening @ least. Till then take care. Love all your recipes to date. It s been the best thing for me since I found your website. I couldn t seem to cook for 1 person, especially since my divorce, you mug recipes did the trick. I don t each very much or very often. Your mug recipes makes it easier for me to eat healthier. Thank you. Just found your site in my search for a quick dessert! It’s lovely and very helpful. We enjoyed your Microwave Mug Apple Crisp this evening and thoroughly enjoyed it! Looking forward to trying more of your offerings! Lots more mug recipes on the way! Can i use oil instead of butter in the apple recipe? And I have ‘Kellogg’s special k’ oats. Not the regular one. So can i ground it and use it instead? And if so,what’s gonna be the measurements? I like to use butter, but you can substitute with oil. I am not sure what Kellogg’s special K oats is! When you change the ingredients you change the result. I suggest you try it, but I cannot tell what your ingredients are, so cannot say what you need. For the Apple Crisp in the mug I would omit the pecans, because I hate them. Other than that I maybe making it for a snack today or the weekend since I want to use up the apple I have. LOL. Thanks for the great mug recipes. I can’t wait to try a lot of them out. I really liked the pecan pie! I actually just made it myself about an hour ago. When I put the pie in the microwave I had but it in first for 45sec. then 25sec. Then the mix started to spill down slowly on the Microwave Also I’m so glad this was a no flour recipe my mom doesn’t like flour it’s just not something my mom likes in the house. I am glad you like this recipe, and not everyone likes to use flour, though it does stabilize ingredients. Oh yea! I’ll maybe use a wider mug but this pie is the best I’m actually going to make it again today for 1 of my neighbors they were wondering how it turned out because I needed to borrow an ingredient we didn’t have. Thxs so much for all these recipes in a mug they are amazing! One more thing since I don’t have flour is there like a replacement I could use or not? Unless you use a meal of some sort, such as almond meal, or even rice flour, but you will need to experiment to see which recipes will suit these ingredients. Almond meal/ground almonds are divine with chocolate, so a little experimentation! Hi Gemma, I love your channel/site! I have made ice cream and just tried the apple crumble above. I think I messed up! In the main ingredients it said 2 tbsp of flour, but the first line of the recipe did not mention adding it in to the crumble… should it have been there? The flavors were great but the crumble very soggy. Is that just because it’s done in the microwave or because the flour was omitted? Thanks so much! Chocolate lava cake, frozen yoghurt and yoghurt bark coming up next! I tried the apple crisp but the topping turned to a cement-like crust. What did I do wrong? that’s funny, I’m not sure about that. I can’t tell if it was the microwaving or the mix. I love the pecan pie but holy crow its sweet! Any ideas for reducing the amount of sugar and sweetness? Thanks! I love all your recipes but every time I try to make a mug cake they smell bad and taste bad and I try a new one every morning and since I am 12 years old my dad thinks I will set the house on fire if I use the oven. So the only thing I can make on school days (that sound good) are mug cakes and they are always overburned . What am I doing wrong? Can i use Karo syrup instead of Golden syrup? Hi—-Love this idea for a quick snack or even a breakfast. Can you use pie filling in these recipes. Looking forward to more delights. Looking for inspiration. I like the idea of small portions. I love your one mug meals. My husband and I can not eat a whole pie or other things that you make. Do you have any sugar free recipes fo pies and cakes? That’s great Terrye, Delighted you guys like it. Myself and my husband CAN eat a whole pie, that’s our problem lol. Feel free to use coconut sugar, agave or maple syrup or any natural sugar you like in my recipes. I have tried most of your mug desserts and love them all. The pumpkin pie turned out great except it was too salty. Your recipe calls for a generous pinch of salt. I tripled the recipe and microwaved three small ramekins. My microwave is 1,000 watts and baked each for 2′ 45″. The texture was too set. Flavor great, but too salty to eat. Will try again. Does the recipe really require salt? You and your recipes are amazing! I always look forward to Thursday, because that’s the day you’re uploading a new video. I’ve made a lot of your recipes, but if it comes to microwaving, it always goes wrong. If I put my mug cake/cookie/pies etc. in the microwave for like 35 seconds in the microwave, it’s completely undercooked. If I put it back for anotjer 15 seconds, it’s completely overcooked! What am I doing wrong? I hope you can help me. If not, I understand. Thank you so much by telling me this, Gemma! I’m going to try it again. I hope this helps! ? Hi – can these pies be baked in a conventional oven at 350F? It worked for a mug cake, I hope it works for these pies. How long do you bake these pies in a regular oven? And also can you bake the mug cakes in a regular oven and for how long at what temp? Thanks so much. Love your site!! The mug cakes work with plastic cups or foam cups. They work in microwave safe cups only. Are the pecans just added on top or are some mixed in? Dying to try the pecan pie. Are the pecans just added on top or are some mixed in? I have been following you for a few months and have tried a couple of your recipes but I have to tell you this pecan pie is to die for!!! Tks for sharing your passion and expertise with us ? I made a couple of Apple Crisp mugs yesterday. They were easy and delicious. I’m ready to try the others now. I am following the Weight Watchers Program and would love to see some of your recipes adjusted to include substitutions/ingredients I am allowed. Thanks. Sorry Arlene, I don’t know what that means. I just saw some of your wonderful ideas and recipes. Thanks for sharing. Wow Gemma they all look so good I thing I am going to try out the pecan one first well thanks so much for this recipe I had no idea you could make microwave mug pies anyway now I can eat them faster thanks again. Couldn’t these be done in 6 oz ramekins in stead of a mug?